Some of Michigan’s top gov­ern­mental posi­tions went blue after years of Repub­lican control in a high-stakes midterm election Tuesday. Gretchen Whitmer will be the first Democrat to take the Michigan Governor’s office in the past eight years after she defeated Repub­lican attorney general Bill Schuette in the race for gov­ernor. Demo­c­ratic Debbie Stabenow beat Repub­lican John James in the U.S. Senate race for Michigan by a 6.03 point margin, according to the AP. This will be her fourth term in the office. Jocelyn Benson won the office of Michigan sec­retary of state. Defeating Repub­lican Mary Treder Lang, Benson will take the seat held by Repub­licans for 23 years. At a Demo­c­ratic election night gath­ering, Benson said that she was ready and would not let people down. “The people of Michigan deserve a sec­retary of state who works as hard as you do,” Benson said. Dana Nessel beat her opponent, Repub­lican Tom Leonard, in the race for Michigan attorney general. While Repub­licans kept their majorities in the state House and Senate, several seats did flip parties. All 38 seats in the Michigan Senate were up for reelection. Prior to the election, 25 Repub­licans held a majority over 12 Democrats, and there was one vacancy. Sim­i­larly in the Michigan House, 110 seats were open. Repub­licans main­tained the majority, but Democrats gained five seats, for a new total of 58 Repub­licans and 51 Democrats. According to the Michigan Sec­retary of State, more than 3.6 million of the 7.4 million Michigan reg­is­tered voters cast ballots on Tuesday, with 99 percent of precincts reporting. In Hillsdale County, nearly 50 percent of reg­is­tered voters showed up to the polls on election day. 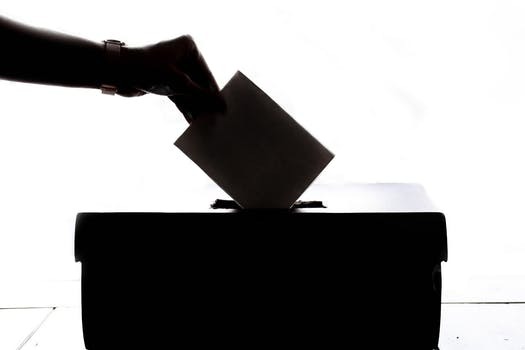 Hillsdale County Clerk Marney Kast said in an email that the amount of absent voter ballots issued was extremely higher, according to her local clerks. Hillsdale County results, however, dif­fered sig­nif­i­cantly from the rest of the state. Nearly 65 percent of Hillsdale County voters chose Bill Schuette for gov­ernor, who ulti­mately only received about 44 percent of the state’s vote. Repub­lican Rep. Tim Walberg won the 7th Dis­trict U.S. con­gres­sional seat for the second time against Democrat Gretchen Driskell. This will be Walberg’s sixth con­gres­sional term. State Sen. Mike Shirkey and state Rep. Eric Leutheuser were both re-elected as well. In the city of Hillsdale, Ward 1’s con­tro­versial council seat will remain empty until a special election in August 2019. 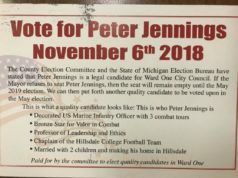 Peter Jen­nings, Ward 1 res­ident and asso­ciate pro­fessor of man­agement at Hillsdale College, received 29 more votes than Dennis Wain­scott, the other Ward 1 can­didate on the ballot. Jen­nings was found inel­i­gible for office in a special meeting of the Hillsdale City Council Aug. 1 due to dura­tional res­i­dency restric­tions. Jen­nings respected the council’s decision and did not cam­paign after the council’s decision was made. Because ballots were already printed for the primary election held Aug. 9, Jen­nings’ name could not be removed. He then won the primary, and voting laws pro­hibited his name from be removed from the November election ballot, according to the County Election Com­mission. Even after winning the election on Tuesday, Jen­nings said he will not join the city council, because the group will not seat him. A special election was already planned to fill the seat of former Ward 2 Coun­cilman Tim Dixon, who resigned in October, so there will be no added costs to the city. Hillsdale Mayor Adam Stockford said that because the council deemed Jen­nings inel­i­gible, the election would not change that. Stockford added that Jen­nings has been a “good sport” these past few months. I was hoping for more spin from the Hillsdale side — is Dr. arnn going to admit that the Trump hand is a losing one in the long run? Obama lost 63 House seats and 6 Senate seats in 2010, his first midterm election. Trump lost around 26 House seats and picked up 3 – 5 Senate seats. There was no Red wave, but there was no Blue wave either. If that is ‘losing one in the long run’ I can accept it. As for the House Dems, they have 2 years to get it together or they’ll be swept from office in the Trump reelection win. If the economy stays at it’s current healthy state, the Dems can run the ticket of Moses and St. Peter in 2020 and Trump/Pence will blown them off the map. I am no big sup­porter of tariffs-ever. But we HAVE to do some­thing about Intel­lectual Property theft. The margins in US goods sold in China are very low, we live or die on inno­vation in our products.Take that away and we have nothing left. A nation has to respect copy­rights and patents. Regardless of any worldly payoff, it is deeply unwise — and for Hillsdale’s sake I dare to add, anti-clas­sical — to hitch an insti­tution to any par­ticular political ide­o­logue. What will remain when the party’s over? For an insti­tution as del­icate (like liberty itself) as my alma mater, probably ruination. I don’t recall Pres­ident Arnn being a major sup­porter of Donald Trump. He was asked who he sup­ported in the 2016 election and as I recall he said that given the choices he backed Trump. It was hardly a glowing endorsement and reflected the quality of the two can­di­dates. Hillsdale College is going to con­tinue to succeed based on the immortal prin­ciples of Liberty, Freedoms and First Prin­ciples which it embraces. They’re uni­versal and as old as the history of the western world. They weren’t even dis­re­garded during the 8 years of Pres­ident Obama and he had an antipathy towards the west based on his father’s expe­ri­ences with colonial England in Africa. Admin­is­tra­tions come and go, the First Prin­ciples con­tinue to shine because they are as rel­evant today as they were 200 years ago.